Posted 9/27/2017 7:21pm by Joe Baughman. This week is always the most difficult newsletter blog for me to write. As you know it is the last week of our 20 week CSA season. I could write about the weather or tell you how busy we are on the farm preparing for the winter growing season or even about the covey of Bob White Quail I saw running around in the weeds on the farm. Pretty cool. Instead I will write a big Thank You to our members. Thank you for supporting our small farm and thank you for supporting the local food movement. I hope you have enjoyed the CSA this year. It is our CSA members that drive the farm from early spring to fall. Although the CSA season is over for this year you will still be able to enjoy our products by visiting the farmers market at Bloomington. The outdoor market runs through the end of November and we will be there most Saturdays. We also will be at the Bloomington Winter Farmers Market indoors at Harmony School beginning the first Saturday of December and every Saturday through the end of March 2018. We hope to see you at the markets. If you took advantage of the Vacation Option Week your last share will be next week. I will be leaving a reminder with your share this week and we will be sending you a reminder by email next week. Your share pick up will be at your usual place next week. Sweet Potatoes the taste of fall and winter. See this week’s recipes one of them is my favorite for sweet potato pie. German Gold potatoes are on the menu again one of my favorite potatoes. A mix of colored Sweet Peppers and a few Green Bell Peppers perfect for stuffed peppers. Butternut Squash and Buttercup Squash. I have not tried the Buttercup Squash but have heard it is very good. And to round things out Lettuce Salad Mix. Enjoy the taste of fall. 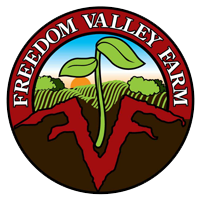 Freedom Valley Farm is now hiring. We are looking for an honest, hard working individual that likes to work outdoors, all seasons, and wants to learn about growing vegetables and selling at farmers markets. If you know of someone that would be interested please have them call me or email me. Jim Baughman 317-508-3845 jim@freedomvalleyfarm.com .